The Detroit Medley is a medley of various songs - including in this medley, depending on the period. 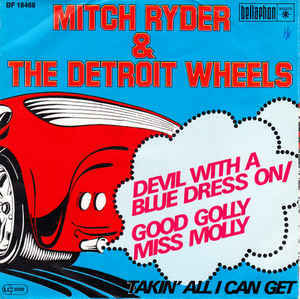 The song titled "Detroit Medley" refers directly to the Detroit Wheels. "Devil With a Blue Dress", "Jenny Take a Ride", "Good Golly Miss Molly" and "C.C. Rider" are the core section of the medley but from time to time it blends in a variety of other songs. Often featuring guitar solos from Springsteen and piano solos by Roy Bittan. Devil with a Blue Dress On (also known as "Devil with the Blue Dress On") is a song written by Shorty Long and William "Mickey" Stevenson, first performed by Long and released as a single in 1964. A later version recorded by Mitch Ryder and The Detroit Wheels in 1966 peaked at #4 on the U.S. Billboard Hot 100. See See Rider", also known as "C.C. Rider", "See See Rider Blues" or "Easy Rider", is a popular American 12-bar blues song, originally recorded by Gertrude "Ma" Rainey in 1924. The boys are too nervous even to say "Hi"